General information: Twinned with Jongleurs. After a brief trip to the Finborough Arms, we ventured out to Clapham to try a few new pubs yesterday evening. The Four Thieves is a large venue with several different drinking areas. The one at the front was patronised by young families. The main bar area seemed to be the local youth and there was another large side room, an outdoor patio and further space upstairs, which we didn't try. Whilst this place brews its own beer, it seems to be more of a hip and trendy place than most other brewpubs. But they had a large selection of their own ales - School Of Hops Citra, Light Ale of Year Edition, Cuddle Me Buff, Pink Grapefruit Sour, Black IPA & London Porter. Apparently they distil their own gin too and I opted for a sloe gin! 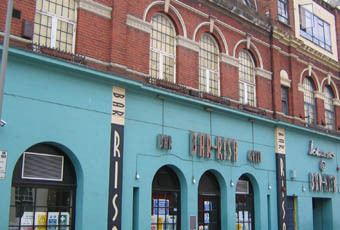 I have it noted down that I came here many years ago when it was Bar Risa. But I certainly don't remember it. A decent addition to the Battersea/Clapham scene. But it may be better to visit during the day when I would imagine it is quieter. Just paid another visit and the choice of ales was excellent from a citra to a black ipa and a stout. Now called Four Theives and is an excellent Laine brewpub with beers from the on site brewery as well as others from their other London brewpubs and guest beers from micros. Excellent range last night from pale to amber, IPA and stout. We didn't eat but food was available. I celebrated my bday here and it was great! Drinks are reasonably priced, music was perfect - classic party tunes (we had to pay a �25 deposit though to get a DJ as they only bring one in if they can guarantee enough people...), open til 2am on Saturdays. Only qualm is that we weren't allowed to dance on the chairs/tables!! this pubs in CLAPHAM JUNCTION!not clapham.